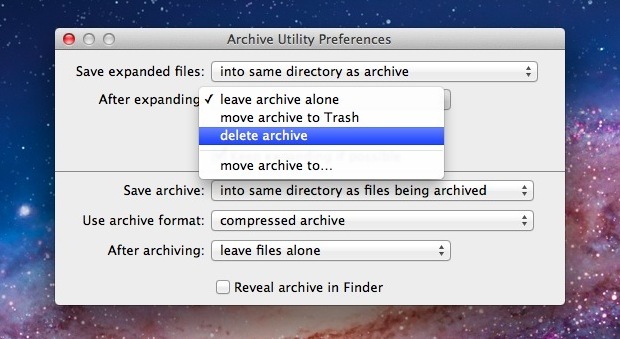 Archives can be deleted automatically after expansion with the help of a hidden preference panel in Mac OS X. This little known ability is an option in Archive Utility, which is the engine and settings controls to the Mac decompression agent that launches anytime you open a zip, sit, tgz, or other archive file formats in OS X. * If you want to use and access Archive Utility preference often, consider making an alias for it in your /Applications/ folder. This is optional, but makes it easier to access in the future if you decide you want to make any adjustments to how archives are handled, saved, or deleted again. Newly extracted archives will now delete themselves, making this a perfect solution for those of us who don’t want a Downloads folder full of leftover .zip files. If you’re not comfortable with the archives being automatically deleted, a happy medium is to choose “move archive to Trash” from the pulldown menu instead. This will place leftover zips, sits, bin, and other compressed files into the user Trash can, but not actually delete them without user input. This is a nice utility. I have always wondered how to do this. Great stuff. Thank you. Not working on amy of our Macs – Snow Leopard, Mountain Lion, Yosemite – the Preferences only seems to apply to archives you manually make using Make Archive in the Archive Utility. I tried adding the Archive pref pane to the System Preferences but it does not change the behaviour in the Finder.